Millennium Bulk Logistics Longview Terminal is an alumina export terminal located near Longview in Washington state. Millennium Bulk Terminals (MBT), a subsidiary of Australia-based Ambre Energy, has proposed to modify the terminal to include a new coal export facility and equipment for cement products imports and distribution. The MBTL proposal is for a facility that would ultimately have the capacity to handle 44 million metric tons of coal annually. The proposed coal terminal is being opposed by environmental groups, which have filed legal challenges against the county permit approving the project. In September 2017 the state of Washington denied a key water quality permit for the project, putting its viability into question. The proposed terminal would be near Longview in Washington state. In November 2009 Cowlitz County approved Ambre Energy's proposal to establish a new 5 millions tonnes per annum export coal terminal. In its application MBT stated that the terminal would be used for alumina, coal and cement. The company proposes to remove an existing ship loader operated by the previous owner and upgrade the dock facilities. The company proposes to retain the existing alumina export equipment which catered for the nearby Longview Aluminum smelter which was formerly owned by Alcoa. MBT stated that "new coal handling operations will include receipt of coal by rail and export of coal by marine vessel ... a new conveyor system will be installed on the existing dock for coal export via marine vessel and will include a series of belt conveyors and transfer towers for moving coal from the stockpile to the dock, and a new on-dock conveyor to move coal to a new purpose built ship loader. Ons ite rail infrastructure and offloading equipment with an extension to the existing rail system, new conveyor systems, and access and maintenance roads. A 525,000 square foot stockpile area will be created to store approximately 300,000 metric tons of coal, which will include a water collection and storage pond to collect runoff, stacker feed conveyors and a coal reclaim system." Early discussion of how many jobs the port would produce was roughly twenty total. According to internal Millennium Bulk Terminals e-mails disclosed on Feb. 24, 2011, the company hopes to export 80 million tons of coal through its proposed west of Longview terminal, nearly 15 times more than the company originally stated in its application for county permit. The revelation was contained in a Dec. 22, 2010 note from Ambre Energy CEO Edek Choros. The company initially announced the terminal would export 5.7 million tons annually. It followed release of internal company e-mails revealing that the company wanted Longview to be the West Coast's largest coal terminal. The e-mails and internal documents were released as part of an appeal of the port expansion to Washington state's Shoreline Hearings Board. The State Department of Ecology has joined the challenge. The state board is scheduled to hear the appeal in April 2011. The application under environmental review, as of 2014, is for a facility that would ultimately have the capacity to handle 44 million metric tons of coal annually. The draft Environmental Impact Statement and public comments can be viewed here. It was announced in early October 2012 that a joint environmental review of the proposed coal port would be conducted by Cowlitz County, the Washington Department of Ecology and the U.S. Army Corps of Engineers. As of October 2013 agencies seeking input on environmental reviews for export terminal proposal held public meetings on the proposed terminal. The review generated more than 163,000 public comments for regulators, to be considered in the draft and final EIS. In February 2014 state and local regulators said the environmental review will consider impacts that extend beyond the site, including global-warming effects from burning the exported coal in Asia and rail impacts as coal is shipped by train throughout the state. The announcement was seen as a victory for project opponents, who said the decision ensures that concerns over coal dust, greenhouse-gas emissions and rail traffic are addressed. The final EIS is expected in 2016. On April 29, 2016, Cowlitz County and the Washington State Department of Ecology made the Draft EIS available for review and comment. The report found the terminal could have “significant and adverse” impact on the climate, and the combustion of coal from the terminal could generate annually as much carbon pollution as 672,000 cars. On January 3, 2017, Outgoing Public Lands Commissioner Peter Goldmark announced he had rejected a request from Northwest Alloys to sublease the state's aquatic lands to Millennium Bulk Terminals for the project. Goldmark said Millennium had refused to provide basic information about its finances following the bankruptcy of its previous owner, Arch Coal, last year. In July 2017 the project received a wetlands permit. It is one of 23 permits the project needs to begin construction. In September 2017 the state of Washington denied a water quality permit to Millennium Bulk Terminals, saying its proposed facility would have caused "significant and unavoidable harm" to the environment. The department cited impacts to air quality, noise pollution and tribal resources, among other areas. In January 2011 Arch Coal acquired a 38 percent interest in MBT "for $25 million plus additional consideration upon the completion of certain project milestones." Arch aims to commence exports through the new terminal in 2012. Arch are the first U.S. company to invest in the project which gives Arch control of nearly 2 million short tons of throughput capacity at the planned facility. Ambre Energy, the Australian-based parent company of Millennium, retained a 62% stake in the terminal. In November 2014 Ambre Energy sold its U.S. assets to Resource Capital Funds for US$18 million, including Ambre's stake in the Millennium Bulk Terminals Longview project. Resource Capital Funds, which describes itself as a "a mining focused private equity firm," will retain 62 percent ownership in Longview, and Arch Coal 38 percent. In May 2016 Arch Coal gave its 38% share in the proposed Millennium Terminal to the project’s last remaining supporter, Lighthouse Resources (previously known as Ambre Energy North America), which in turn is owned by Resource Capital Funds. Arch had declared bankruptcy in January 2016, and got no money in return for “selling” its interest in the coal terminal. Environmentalists stated that they would oppose any such actions, arguing that coal contributes to pollution and global warming. Groups including the Sierra Club and Columbia Riverkeeper have vowed to stop the industry's expansion into Asia, a market currently dominated by coal from Australia and Indonesia. On December 13, 2010, a coalition of conservation and clean energy groups, including Earthjustice, the Sierra Club, Climate Solutions, and Washington Environmental Council, challenged the permit Cowlitz County issued to allow MBT to build the coal export terminal. The groups stated that the facility would threaten public health and runs counter to state efforts to curb greenhouse gas emissions. The groups argue that the county ignored consideration of issues such as the "consequences of burning coal in Asia", the effects of increased coal mining and transport and the effects of transporting the coal via ships to Asia. "The county commission rubber-stamped the permit and ignored their duty to act in the best interest of the community," said Earthjustice attorney Jan Hasselman. According to Earthjustice, it was the first legal challenge to US exports on coal on the West Coast of the United States. "We expected an appeal, so we're not surprised," Joseph Cannon, chief executive officer of Millennium Bulk Logistics, the Ambre Energy subsidiary, said in a telephone interview after the appeal was filed. In late December 2010 Washington state stated that officials in Washington state's Cowlitz County did not go far enough in evaluating greenhouse gas emissions from the proposed Longview port upgrade. Washington's Department of Ecology filed a motion on December 28, 2010 to intervene in an appeal of the county's decision to allow the upgrade. The department said it wanted to ensure its concerns about greenhouse gas emissions are adequately addressed. In a statement, the department said the county's environmental review should have analyzed greenhouse gas emissions more broadly. The hearing before the Shoreline Hearings Board will be on April 11. Ahead of the hearing MBT have filed a document seeking the dismissal of the appeal on the grounds that the environmental groups don't have standing to sue and argued, according to the Wall Street Journal, that greenhouse-gas emissions and climate change from the burning of the coal are "geopolitical issues" beyond the jurisdictional scope of their appeal. "There's something troubling about a foreign corporation stating that Washington residents don't have access to Washington courts to enforce Washington laws to prevent harm from climate change." said Earthjustice attorney Jan Hasselman told the WSJ. Montana Gov. Brian Schweitzer and Washington Gov. Chris Gregoire, both Democrats, met on January 5, 2010 to discuss to proposed export terminal. Gov. Schweitzer stated that he believed that Washington state will give fair treatment to the proposal to build the terminal. The coal that would ship out of the facility would be mined in the Power River Basin of Montana and Wyoming. In early March 2011 Millennium Bulk Terminals CEO Joe Cannon stated that the firm would withdraw consideration of the coal export proposal from its initial application and seek approval for it separately. It would also apply for a separate permit to export coal. "We're absolutely still committed to coal," Cannon said. "But it's clear there's been a lot of controversy. Our view is OK, we'll pull back and do an (environmental impact statement) that everyone can participate in, so everyone gets their full innings on the issue of coal." Brett VandenHeuvel, Columbia Riverkeeper's executive director, dismissed the company's change of tack as a move to "try to fool the public and piecemeal this project. They're proposing to build the very same dock that would serve 1,000 coal ships per year. It's just more hiding the ball." On December 13, 2010, a coalition of conservation and clean energy groups, including Earthjustice, the Sierra Club, Climate Solutions, and Washington Environmental Council, challenged a permit to build a coal export terminal in Longview, Washington, the Millennium Bulk Logistics Longview Terminal. The groups stated that the facility would threaten public health and runs counter to state efforts to curb greenhouse gas emissions. "We expected an appeal, so we're not surprised," Joseph Cannon, chief executive officer of Millennium Bulk Logistics, the Ambre Energy subsidiary, said in a telephone interview after the appeal was filed. A trial is set for April 2011. In late December 2010 Washington state stated that officials in Washington state's Cowlitz County did not go far enough in evaluating greenhouse gas emissions from the proposed Longview port upgrade. Washington's Department of Ecology filed a motion on December 28, 2010 to intervene in an appeal of the county's decision to allow the upgrade. The department said it wanted to ensure its concerns about greenhouse gas emissions are adequately addressed. In a statement, the department said the county's environmental review should have analyzed greenhouse gas emissions more broadly. Montana Gov. Brian Schweitzer and Washington Gov. Chris Gregoire, both Democrats, met on January 5, 2010 to discuss to proposed export terminal on the lower Columbia River in Washington state. Gov. Schweitzer stated that he believed that Washington state will give fair treatment to the proposal to build the terminal. The coal that would ship out of the facility would be mined in the Power River Basin of Montana and Wyoming. On January 12, 2011, Arch Coal stated that it was going to buy a 38% ownership stake in the coal loading facility planned for Longview, Washington. As such, they are the first U.S. company to invest in the project. The $25 million stake in Millennium Bulk Terminals-Longview, gives Arch control of nearly 2 million short tons of throughput capacity at the planned facility. Ambre Energy, the Australian-based parent company of Millennium, retained a 62% stake in the terminal. A report released in January 2011 by the Western Organization of Resource Councils (WORC) titled Exporting Power River Basin Coal: Risks and Costs laid out several negative environmental impacts from expanding PRB coal mines and exports. First, WORC noted that an increase in greenhouse gas emissions would ultimately occur, contributing to global warming, stating that "Exporting 140 million tons a year would produce roughly 280 million tons of CO2 per year." Second, WORC wrote that a coal mining increase would impact the local environment and surrounding communities, citing in particular air quality degradation due to an increase in particulate matter and land and water strains. WORC also reported that new rail lines would cause disruption to farm and ranch land and could negatively impact migratory animal corridors. More railways would also impact public safety with an increase in the potential for accidents. Diesel pollution would also increase because trucks and vehicle transportation would expand. Coal Dust was also noted as increasing due to mine expansions, which could cause harm to water and people. In February 2011 it was revealed that the Millennium Bulk Logistics Longview Terminal, a subsidiary of Ambre Energy, attempted to limit what state officials in Washington state knew about its long-term goals during the early permitting process for a port development in Longview, Washington in 2010. The company's initial application stated that the port would be set up to export up to five million tons of coal annually. However, court records released as part of the discovery process in a lawsuit brought about by environmental groups showed that Millennium hoped to greatly expand their operation from five million to a second phase increase to 20 million tons or even 60 million tons annually. The finding indicated that the challenge to the port is likely to increase, Earthjustice, a group involved in the original challenge, filed a request to add the new documents to its appeal of the project permit. 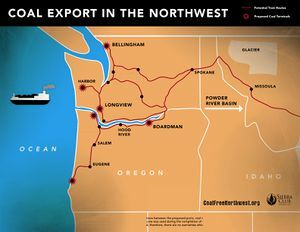 According to internal Millennium Bulk Terminals e-mails disclosed on Feb. 24, 2011, the company hopes to export 80 million tons of coal through its proposed west of Longview terminal, nearly 15 times more than the company originally stated in its application for county permit. On March 7, 2011 Millennium Bulk announced that it was removing its coal export and related infrastructure proposal from a pending shoreline development permit for a port in Longview, Washington. The company stated that it was going to do a thorough environmental impact statement with public input before proceeding with it plans to redevelop the port for coal exports. The company acknowledged its decision was largely based on the opposition to the company's plan to export coal. On March 15, 2011 Millennium Bulk stated that they would resubmit the state permit for the Longview port development after they conduct an environmental study of how much coal, cement and alumina the facility could handle at former Reynolds aluminum smelter site. On August 9, 2011 Vancouver and Longview citizen groups announced they are suing Millenium Bulk Logistics, the owner of a proposed coal terminal in Longview. The groups contended that Millennium Bulk Terminals is violating the Clean Water Act by handling coal without a permit. The groups in the suit that Millennium did not obtain a proper permits for stormwater and wastewater disposal while handling coal, petcoke and other materials on the location of the proposed coal terminals. Millennium has been working on a cleanup of the Columbia River site since the beginning of the year. Millennium inherited a giant pile of petcoke from the site's former tenant, Chinook Ventures. ↑ Ambre Energy, "Ambre Energy completes acquisition of Port site in Longview, Washington", Media Release, January 13, 2011. ↑ "Millennium Bulk Terminals – Longview: Cowlitz County, Ecology, and the Corps are in the process of preparing a NEPA EIS and a SEPA EIS," Millennium EIS, accessed July 2014. ↑ "Extended meeting times, ground rules for meetings announced by agencies seeking input on environmental reviews for export terminal proposal" Washington Dept. of Ecology, September 6, 2013. ↑ "Thousands weigh in on plan for coal terminal in Longview" Phuong Le, Associated Press, November 18, 2013. ↑ 6.0 6.1 Scott Learn, "Cowlitz County approves permits to export coal to Asia from port in Longview, Wash.", The Oregonian, November 23, 2010. ↑ 7.0 7.1 Cowlitz Country, "Modified Mitigated Determination of Non-Significance", November 9, 2010, page 1. ↑ Eric Olson, "Millennium internal e-mail reveals goal of 80 million tons in annual coal exports" TDN, Feb. 24, 2011. ↑ "Proposed coal terminal near Longview faces broad review," Seattle Times, Feb 12, 2014. ↑ Peter Gartrell, "Arch Coal buys 38% stake in West Coast port to ship coal to Asia", Platts.com, January 12, 2011. ↑ Scott Learn, "Mining companies aim to export coal to China through Northwest ports", Oregonian, September 8, 2010. ↑ Matthew Brown & Phuonge Le, "Coal Industry Seeks to Export Through Wash. State", Associated Press, November 16, 2010. ↑ "Riverkeeper and Allies Challenge Permit Allowing Dirty Coal Export to Asia", Columbia Riverkeeper website, accessed February 2011. ↑ "WA intervenes in coal-export port upgrade appeal", Associated Press, December 28, 2010. ↑ Joel Millman and Kris Maher, "Coal Port Takes Its Lumps: Critics Say Exports Would Hurt China's Air; Backers Cite Expected Jobs Boost", Wall Street Journal, February 4, 2011. ↑ "Montana, Washington governors discuss coal exports" Associated Press, January 5, 2011. ↑ "WA intervenes in coal-export port upgrade appeal" Associated Press, December 28, 2010. ↑ "Arch Coal buys 38% stake in West Coast port to ship coal to Asia" Peter Gartrell, Platts.com, January 12, 2011. ↑ 49.0 49.1 "Exporting Power River Basin Coal: Risks and Costs", Western Organization of Resource Councils (WORC), January 2011. ↑ "In Northwest, a Clash Over a Coal Operation" William Yardley, New York Times, February 14, 2011. ↑ "Millennium Bulk Terminals says it won't pursue exporting coal out of Longview -- for now" Scott Learn, Oregonlive.com, March 7, 2011. ↑ "Company to resubmit permit for coal-shipping port" Bloomberg News, March 16, 2011. ↑ "Millenium to restart coal terminal permit process" Erik Olson, Daily News, March 15, 2011. ↑ "Groups sue Millennium over alleged Clean Water Act violations" Erik Olson, TDN.com, August 9, 2011. Ambre Energy, "Ambre Energy completes acquisition of Port site in Longview, Washington", Media Release, January 13, 2011. This page was last edited on 26 September 2017, at 18:15.